John Doppler Schiff. Know the name? You would if you were a hoarder or a breeder. You see, John Doppler Schiff is one of the people behind CaboodleRanch.net, a website devoted to profiling the cruelty behind the Caboodle Ranch Cat Rescue Sanctuary. Caboodle Ranch was raided in 2012 after years of people voicing concerns about the rescue. Over 700 cats were removed from the premises, many of which were injured and/or ill. This despite founder Craig Grant’s having received almost a quarter of a million dollars in donations in 2010. Bank records reveal he had almost $80 thousand on hand at the time of the raid. Photo taken at Caboodle Ranch in 2009. Amazingly, the so-called sanctuary operated for another 2 years. You’d think that the animal welfare community would be pleased. And yet, the Internet was abuzz with people defending Caboodle Ranch and Craig Grant. So who were those defenders? Fellow hoarders and breeders who jumped on the bandwagon to create mistrust of the rescue organizations caring for the animals. Recently I asked Mr. Schiff a few questions about that experience. Me: Why do you think so many people have defended Craig Grant and Caboodle Ranch? Schiff: The psychology is complex and thorny. Many of these supporters have donated money to Caboodle Ranch. They trusted Craig Grant. They were taken in by the façade of happy cats frolicking in brightly painted gingerbread houses. For them to acknowledge the cruelty that occurred there would be to acknowledge that they indirectly contributed to it, that they permitted the suffering and death of countless cats — in many cases, cats that they themselves dropped off at the Ranch. For many, that level of honesty is too painful to bear. Me: I can imagine. But the intensity of their attacks was frightening. Schiff: PETA’s role in exposing the cruelty and the ASPCA‘s role in caring for the cats also attracted supporters with a grudge against animal welfare organizations. Convicted animal abusers and hoarders came out of the woodwork to support Caboodle Ranch. They held the raid up as proof of a sinister conspiracy against “law-abiding pet owners and rescuers,” and shared stories about how they too had been “victimized” or had their “property” stolen by animal control. Craig Grant was presented as a saint, a martyr, and the Big Bad Animal Rights Organizations were presented as animal haters resentful of Grant’s success and donations. Even when confronted with pictures of cats dying in agony amid the filth of Caboodle Ranch, supporters will go to extraordinary lengths to deny that evidence. “The raid was staged. The pictures are Photoshopped. The cats were like that when the Ranch got them. PETA spies planted those maggots and dead cats. Craig is a saint, he just got overwhelmed. Craig was framed. The cats would have been euthanized if Craig hadn’t saved them.” It’s an endless litany of justifications and excuses to explain away animal cruelty, and yet, these wild theories are easier for supporters to accept than the simple fact that Craig Grant is a hoarder. He betrayed their trust, and allowed hundreds of cats in his care to suffer without proper care. Surprisingly, this sympathy for the abuser and blindness to the suffering of the animals is not unusual. We saw it in the Haven Acres case, and again recently in the Olympic Animal Sanctuary standoff. No matter how horrific the suffering of the animals, there’s a core of supporters who are able to justify the cruelty to themselves. Me: What’s the status of Mr Grant and the Caboodle Ranch? Schiff: Despite the solid evidence arrayed against Craig Grant and the near-100% recidivism rate of hoarders, the prosecutor offered a plea deal. Craig Grant admitted guilt on the felony and misdemeanor charges of animal cruelty but would not be subject to jail time; instead he received 24 months of probation, and paid $1,790.00 in fines and court fees. That was it. And then he will be free to start hoarding again. 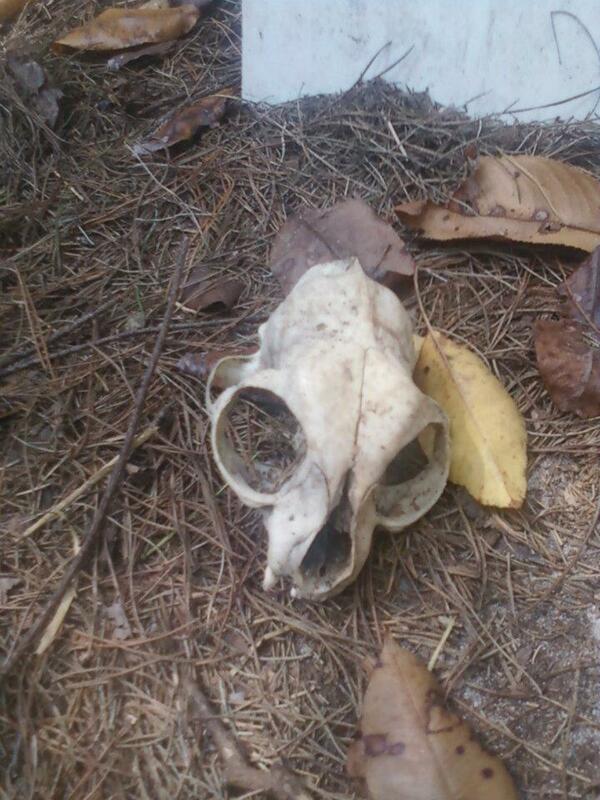 The bodies of dead cats were not buried, but allowed to decay and rot on the premises. Me: That’s all he got? I am flabbergasted! Me: And you know what frightens me? That there are lots of folks out there that are fool enough to give this guy more money. Tomorrow we’ll reveal Schiff’s recommendations to avoid enabling a hoarder. By the way, I purposely chose some mild photos. There are many that are much worse. 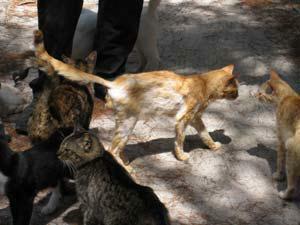 If you truly want to see the extent of misery the cats at Caboodle Ranch lived in, check out CaboodleRanch.net. « Don’t Care About Animal Welfare? Here’s Why You Should. Hoarders ….and ones with financial motives to boot….I wish people had the level of doubt I always do and check check and re-check before donating money to these people….the internet has made it easier to hide things but with a few well placed searches and questions you can find the truth. Horrid.I hear hoarder I see my Pickles..her tiny little body never really growing to full size…I smell the stench from the roadside of the house in which I found her…. This guy had over 700 cats and they were outside! Animal control enabled him. Donations poured in, and still are! And he fully intends to start all over again once he’s off probation. I am sick! Sick! That this is allowed to go on. Animal control was fully aware of what was going on and did nothing. The sheriff was aware and did nothing. It wasn’t until PETA began raising a stink that anybody did anything about this guy. And there are plenty of others just like him. They collect lots of money, put on a good show for the world, and animals suffer. 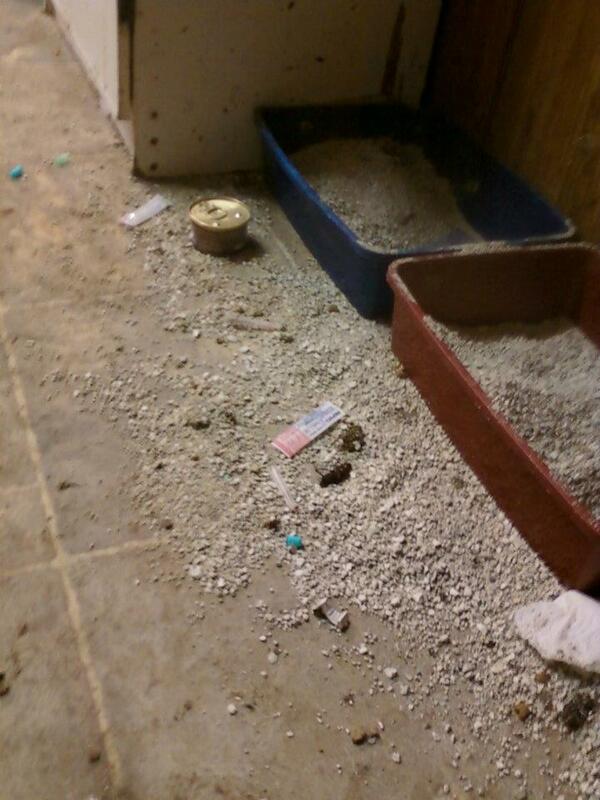 These hoarders and their enablers need to be charged with as many counts of animal abuse and neglect as there as cats. They need to return all the money that they received from donations because obviously they did not use the money for the health and welfare of the animals. All animals shelters, breeders need to be licenced so they can be investigated without warning. Sick people. Sick people indeed!! make my blood boil…thankgod my Pickles is one of the lucky ones…poor little thing..broke my damn heart how I found her..and this womans family did nothing!! Wow, I went to the website and took a look at the information. I wish there was an easier way to diagnose people who hoard or could possibly hoard, rather than wait until things escalate to the point that authorities have to get involved. After reading this and other posts by you, I will only be donating funds to places I see on person. The sad part is authorities KNEW what was going on and let it continue for years. How terrible these pictures are…..I can’t imagine there are much worse pictures……oh no…..I’m so angry about this Craig guy….what’s his problem? Why he do this to these innocent animals again and again…..well….I can’t wait for reading tomorrow’s post about how to avoid helping those crazy humans…. I don’t even know what to say! And despite all this evidence he will do it again AND some people still think this person is a good guy!?? WTH? It’ just disgusting what these so called animal friends do! It’s not only hoarders, as a wildlife rehabilitator I find animal abuse at rehab centers as well, keeping wild animal in captivity in small Cages for months or for a lifetime! I agree with fozziemom. If an animal is living a life not worth living (in pain, starving, unloving, ect) sometimes the best thing to do is just put them out of their misery. Not draw out their suffering. It sure makes us want to make sure we know where we’re sending our money. Thanks for the info. And one-fourth of all hoarders investigated are designated as rescues. There are people out there who do not believe animal cruelty exists and will do anything to deny it. But the judge! He or she how s/he look at the pictures and think that 24 months and less than $2000 was a strick enough sentence. How could the judge have not given a stipulation that he never be allowed to own another animal. You have to understand Florida. We all know about the beaches and the money in the coastal areas, but there are some counties that are extremely impoverished. He copped a plea, the DA took it and the judge accepted it. It saved the cost of a long, drawn-out trial. Besides, the laws in FL wouldn’t have allowed he be given much more than that anyway. What they tried to do was to get former donors to sue him for misusing the money. Donations were used to go to Vegas and to the Daytona 500. Not sure if that went anywhere. Sad commentary on soc-called Sanctuaries…iI used to think Caboodle was all right too…but when the first story circulated I knew something was wrong. This happened here with a local Shelter & there was quiet a shake-up. People were fired; alot of things were said. Some things proved; some not proved. I drop by every so often & have encouraged people to do the same & see how clean the cages are et cetra! Things have improved & they know they are being watched. However the damage is done…many people no longer trust the Shelter & just let their unwanted (for whatever reason) 4 leggeds go which is adding to the feral numbers….so we formed a group to TNR the ferals…we just seem to go round & round tho’. I think that Craig guy should have done jail time; paid a far heftier fine & should have a lifetime ban from having any animals for any reason!!! Wow. I didn’t realize the extent of the enabling. Thanks for reporting on that angle. Such a sad, sad story. I saw this in my email when you posted it and have been meaning to stop by. How terribly sad, and we owe a lot to PETA and others who work for the betterment of animals. It’s interesting how blind the “sanctuary”‘s supports are. Warning bells and red flags would go off and up when they look for a place where they will be free to do as they wish. My mother in law has started hording as she has gotten older. Not animals thankfully, but food and inexpensive items and we aren’t sure how to handle it, It’s constant cleaning up behind her or when she won’t notice, but I’m not sure that’s the best we can do. We’ve been able to keep it under control as far as health standards are concerned but she gets so upset. I’m on to read the second part of this. Sorry, that should be “should go off” not “would go off”. It’s difficult to deal with any hoarder because you’re limited in what you can do. Unless you can prove she’s a danger to herself or others, you really can’t do much for your mother-in-law. Even for those that hoard animals, most places only require adequate food, water, shelter and freedom from suffering. That’s not much, when you think about it. People in Florida who allowed their cats to have litters are also responsible for all this horrible suffering. It all comes back to unless we elevate the status of cats many will end up with sick people like this man. Why the judge didn’t seize some of the money in the bank to help pay for the expenses incurred when he was shut down is crazy. The law is what it is. And until we convince folks that there are no magical cures for an excessive numbers of animals, we’re not going to see a push to change the laws. And, truth be told, it’s not just Florida. I seldom drop comments, but i did some searching and wound up here Animal Hoarders and their Enablers: An Interview with John Doppler Schiff | Rumpydog. Is it just me or does it look as if like some of the remarks look like they are coming from brain dead folks? 😛 And, if you are posting at additional sites, I’d like to keep up with everything new you have to post. It’s great that you are getting ideas from this post as well as from our dialoguue made at this place.